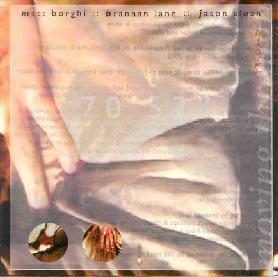 Matt Borghi/Brannan Lane/Jason Sloan - "Moving Through"
We've reviewed quite a bit of ambient artist Matt Borghi's work in these pages. And he seems to be actively seeking collaborative opportunities. Last year saw a fine release by Matt and Cyber Zen Sound Engine, and this new release teams Matt with Brannan Lane and Jason Sloan. Sloan is new to me and Lane I've had one experience with having reviewed his Caribbean Dream CD way back in AI #6. The music on Moving Through began life as an 8-minute track that Sloan and Lane had completed but lay dormant for some months until Borghi got involved. The result is one continuous 70 minute ambient journey with Lane on synth and treatments, Sloan on keyboards, piano, loops, voices and ebow, and Borghi on treated guitar and effects. The music develops very slowly but seamlessly, sweeping across an evolving aural landscape with all the expected peaks and valleys. With the headphones on and eyes closed I really felt like I was floating just above the surface of some dark planet. The every so slightly changing waves of sound produced sensations ranging from rising over small hills to descending into a deep unknown. The changes in the music are gradual and immersing oneself in this work as a whole demands the listener's undivided attention. But surrender your imagination and this trio of artists will provide you with just the sonic drug needed to create your own trip. Better hurry though because this is a limited edition run of only 100 copies. AI: I understand you studied jazz and classical music prior to your interest in Ambient Space. Was For Running Time your first foray into this genre, and did you do any recording previously on more traditional instruments in non-ambient related styles of music? Matt Borghi (MB): Yeah, but they weren't really good. I liked overdubs and using tape in the past always created a lot of hiss and lo-fi sounding recordings. For Running Time was interesting, and even more interesting to reflect on now. FRT was different than all of my works before or since. FRT was a freshman approach in every sense of the phrase. With it I created a recording that was more like a resume of a different moods, or styles rather than it was a cohesive listen. Another thing about FRT, something that I've realized lately, is that FRT dealt with composition, the assembling and crafting of a piece, that's the classical/jazz influence, where everything that's followed it was sonically and conceptually-based. My works have had more to do with how they were created than the actual creation itself. I only recognize this now as I'm stepping away a bit from these sound-for-sounds-sake works. Effectively I have three projects going right now. First, is my KOSIK project, which is a sort of glitch/IDM project that has supplemented harmonic textures for rhythmic textures with lots of ambient, industrial, and noise elements thrown in. Second, is my solo work, under the name "Matt Borghi" and third is the Slobor Media label, which is a collaboration between Jason Sloan and myself for releasing dark ambient, and experimental works. AI: Do you feel that having studied music formally has been a benefit to you as an ambient artist or is the nature of space ambient music such that it doesn't matter? AI: It's easy for me to sit back and let the images evolve in my brain while listening to space ambient music. Kind of the clouds in the sky thing. But at the same time, I enjoy a listening experience like your Huronic Minor album where I approached the music having read the background on the 1913 storm that influenced the music and your research into the event. So the imagery in this case is influenced by knowledge of a subject but I enjoyed the guidance all the same. MB: Many, many people have come to really enjoy Huronic Minor (HM). I created those tracks in between mailing out promos of FRT. Originally it was a whole 'nother record, and then I heard some VidnaObmana and with HM I tried to emulate those sounds. As the record was most of the way done my hard drive took a dump and I was left with only audio fragments of the original files. I took to task making an extremley minimal ambient recording out of the elements that were left. I was simultaneouly discovering the story of the Great Storm of 1913. AI: What kind of equipment do you typically use on your recordings and in live performance? I would assume mostly synthesizers and electronics but your contribution to Moving Through is treated guitar and effects. MB: Typically for recording, I use an acoustic guitar. Nowadays I use electric more, and I've even been getting back into synthesizers, but for years I didn't do anything without a guitar. In fact everything since and including Huronic Minor is guitar-based, usually acoustic, always treated with effects, and always with strange tunings. For "live" performance I've found all of the possibilities in a two laptop set up. AI: Tell me about your live performances. Do they tend to be single continous pieces like Moving Through? I know you're a visual artist as well so is there a visual element to your performances? AI: Your web site description indicates that the Kensington Hill/Falling CD tracks were recorded at art exhibits. Can you tell me a bit about these events, and are there other such events you've been involved in? MB: Actually they were recorded as sound art exhibits... well, actually multi-media digital exhibits with a sound element to the show. There aren't a lot of these events happening. The art world is just starting to realize that sound can be just as engaging as a painting or other forms of visual arts, and they are reacting accordingly. But still there are very few sound-specific shows, or even large, extended shows for that matter. By the time most people hear about these things, it's mythic because they are over, and have been for a while. Maybe it's a publicity issue? I don't know. AI: Were there significant differences between the collaboration process or the way the music developed between the CD you did with Cyber Zen Sound Engine and the current Moving Through CD with Jason Sloan and Brannan Lane? MB: The short answer might be that, for the CZSE/Intercepted Transmissions (IT) project they did all the work, but for Moving Through, I took on a lot of the project. I mean there was a significant portion there, but there wouldn't have been a release, because the originaly track that I got from Jason and Brannan was about 7 minutes long. That's really the most basic difference, as far as I know, because I really don't know what CZSE did to get the finished IT, it's kind of a mystery to me. I know a little about their hard and software, but ultimately that's it. IT came about because I wanted to hear how other people might rework my tracks. So I set out to create 11 or 12 pieces and I sent them out to a variety of people, including Forrest Fang, Stephen Phillips, Cyber Zen, Kelvin Smith, and a half-dozen others. I received finished pieces back from Forrest and Kelvin, but not enough to make even a compilation. After nearly a year had passed and I hadn't heard from Dan of CZSE. I had all but given up on the thing. One day he wrote to me and told me that they had finished something that wasn't quite ambient, but was good nevertheless. I wasn't sure what to expect. I was doing a lot of music journalism work at the time, and listening to a lot of music, so I welcomed more. I remember the first day that it came in the mail. I was blown away by what they had done. In fact I still give them much more credit for that release than I ever do myself. They crafted an exciting and beautiful recording that defied genre specifications, and to date was the most widely accessible recording that I have had the pleasure of having my name on. With Moving Through, on the other hand, Jason and Brannan collaborated on a track. It got shelved, but I was curious to hear it. Jason mailed it out to me and I listened to it often. It was short, only about eight minutes... this was around fall/winter 2001. I went to work on it in a six-week period when I wasn't performing much in the late spring/summer 2002 and wrapped it up. I extended the track by about 62 minutes, and added a variety of guitar parts throughout the fabric of the piece that Jason and Brannan created. I kind of hate loops, so instead of just looping their original piece, I tweaked it a little bit, sampled it, mapped it out on my keyboard, and actually performed the additional 62 minutes. Once I lengthened it I added my guitar parts. AI: Any other interesting collaborations we should know about? MB: The two big things going on right now are the Slobor Media label that Jason Sloan and myself have put together, and my new KOSIK project. There's a long-form collaboration going on with Stephen Phillips. A great piece, but I'm not sure of releases or any of that. I also completed a long-form work for Cyber Zen Sound Engine back in the Spring. No word on that one yet either. I recently completed one track with pedal steel guitar-master, Bruce Kaphan, but plans of a full release are only tentative. Jason Sloan and myself have completed a series of tracks for Gigi (aka Oophoi, aka the Deep Listenings Editor), but still not enough for a full release. Jason and myself have also completed an extremely gritty ambient project that we're calling Guilford. I think there's more, but this list is entirely too long. AI: I get the impression you get to perform live fairly often. And that you travel/tour as well. MB: Yeah, a lot this year, probably 20 or 30 performances. That's a lot considering that when I played the first official show with Defender, a show that you helped liasion, might I add, I hadn't done anything like this before "live" and I haven't been on the stage this much since my early punk rock days. Admittedly, though, every show is a little different, and I've transitioned this year from band-oriented space/ambient to straight ambient noise with two laptops... lots of experimenting with "live" performance. I will say this, though, and I like to every chance I get... there's no place like Cleveland when it comes to playing this kind of music. Detroit hates the stuff I play, but Cleveland has such a well-developed and aesthetic decisiveness about electronic music, particuarly music that's beatless. I've had more great experiences in Cleveland, Kent, Akron, etc... than anywhere else, anytime. AI: Have all your CD's been self-released except for the Elegy For Time CD on the Space For Music label? AI: I was revisiting the What Is Ambient Space essay you wrote in Aural Innovations #11 and the first line says that you consider Ambient Space to be a sub-genre of New Age. My conception of New Age is relaxing accessible music, usually with some discernible (or overt) melody, that is easy for the average listener to tune in to. Ambient Space, and something like Moving Through, for example, makes greater demands on the listener in that there's a lot happening but it develops very slowly and only by attentive listening can one really benefit from it. MB: You're right. At the time I wrote that, almost three years ago now, I think that I was trying to figure out just what the hell I was doing, and where it was coming from. I was trying to find a classification. Eventually, I settled on ambient, and dropped the "space" part. More and more, though, especially with Moving Through, there are bits that sound like some kind of early Throbbing Gristle-like industrial or something like that. It's strange how things unfold. AI: Tell me about your new label. Is Moving Through the first release on this label? MB: The new label that Jason Sloan and I have started is called Slobor Media. Actually I just threw a splash page up with our new logo last night. Moving Through, officially, isn't part of Slobor, but unofficially it was the guinea pig release to see if such a model might work. 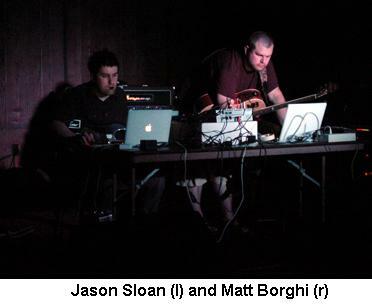 With Slobor Jason and myself would like to put out the music we enjoy, but also only for a limited time. What do I mean? Well, as capatalist consumers we expect everything to be available for sale. But sometimes the most beautiful, the most collectable things are not, and that's probably how they become collectable. I discovered this first-hand when I started looking around for reissues of some Muzaky Jackie Gleason lounge recordings remastered for CD. There weren't any. I had these crummy, scratched records, but nothing with the sonic quality that I knew the music should be heard in. I searched high and low for these things. Lo and behold I found a CD with most of the works, but it wasn't easy. I want to take this same approach with the label. Jason and I release something in very limited quantities, 1-200, and that's it. Once they're sold out, that's it, no re-releases. Jason hand-designs very unique packaging, a labor of love, more than anything, to go with the music. We want to put out a gem of a recording, but also have the packaging be such that you really covet the release. We were inspired by the packaging of Throbbing Gristle, Vaughn Oliver/4AD, Zoviet France, and others in this way... actually Jason first. But as he turned me on to this unique packaging and made me more and more design conscious I had no choice but to accept this direction. For me what a release looked like was secondary. Anybody who received Huronic Minor knows this. I used a clunky anti-static sleeve, a Maxell CD-R, and I scribbled my name, the title, and my email address across the cover. Until the last few months, the music was A1. Now though, things have shifted, with my releases, KOSIK releases, and certainly Slobor releases. Visit the Jason Sloan web site at: http://www.jasonsloan.org. Visit the Brannan Lane web site at: http://www.brannanlane.com. 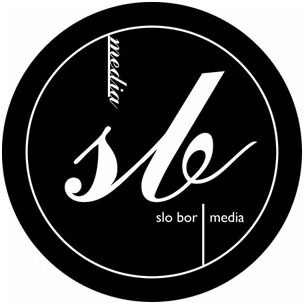 Visit the Slobor Media web site at: http://www.slobor.com. Contact via snail mail c/o Slobor Media; PO Box 181; New Hudson, MI 48165-0181.